19456 NETPL834.jpg 500X638\NETPL834.jpg 53916 NETPL834_1.jpg 500X638\NETPL834_1.jpg 53917 NETPL834_2.jpg 500X638\NETPL834_2.jpg 53918 NETPL834_3.jpg 500X638\NETPL834_3.jpg Send A Hint! 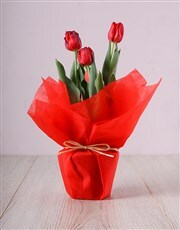 Product Description: less text Tulips are one of the most admired flowers around the world, so the fact that they are now in season is a real treat! 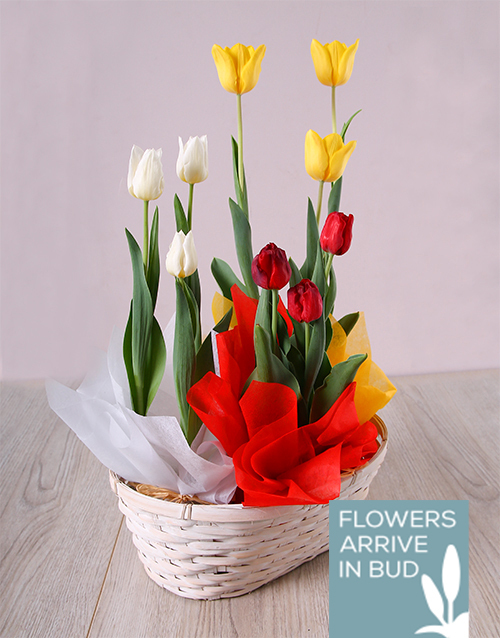 Surprise someone special with this gorgeous Mixed Tulip Basket, which consists of 3 vibrant tulips displayed in a double Chrysanth basket with non-woven paper and raffia. 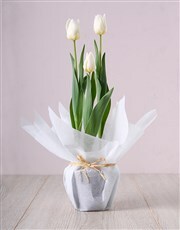 It's the perfect flower gift to show how much you care, so send online with NetFlorist! 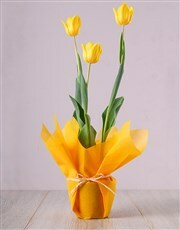 Colour of Tulip may vary. 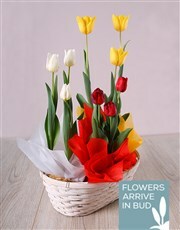 Flower arrives in bud Get this Mixed Tulip Basket delivered with NetFlorist.